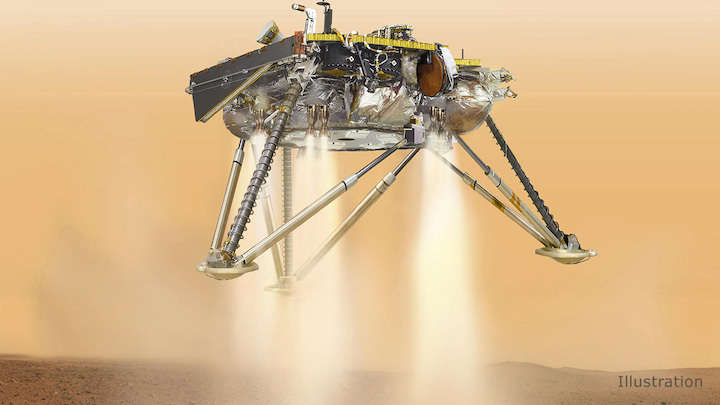 An artist's illustration of the InSight lander on Mars. NASA's upcoming landing of the first-ever mission to study the heart of Mars will be the topic of a media briefing at 1:30 p.m. EDT Wednesday, Oct. 31 at NASA Headquarters in Washington. The briefing will air live on NASA Television, the agency's website and the NASA InSight Facebook page. 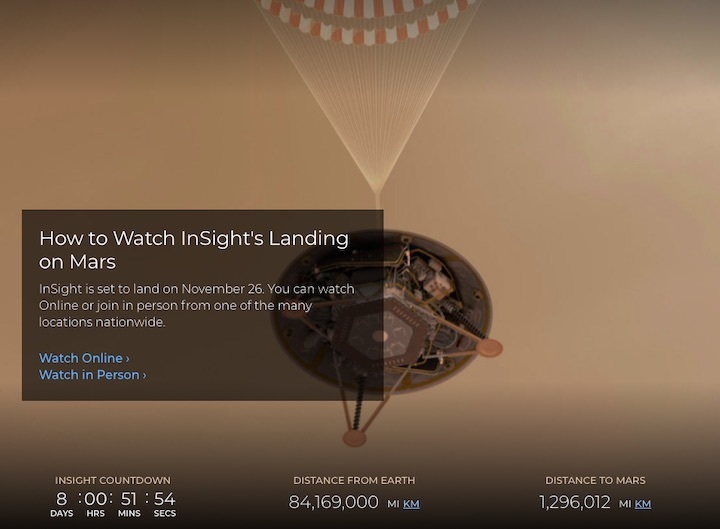 NASA's InSight Mars Lander (Interior Exploration using Seismic Investigations, Geodesy and Heat Transport) will land on the Red Planet at approximately 3 p.m. EST (noon PST) Monday, Nov. 26. InSight will study the deep interior of Mars to learn how all celestial bodies with rocky surfaces, including Earth and the Moon, formed. The lander’s instruments include a seismometer to detect marsquakes and a probe to monitor the flow of heat in the planet's subsurface. Media not attending who would like to ask questions via phone during the event must provide their name and affiliation by noon EDT on Oct. 31, to JoAnna Wendel by email at joanna.r.wendel@nasa.gov. You can read more about how the science of the mission is unique here. A press kitreleased today includes additional information on the mission. 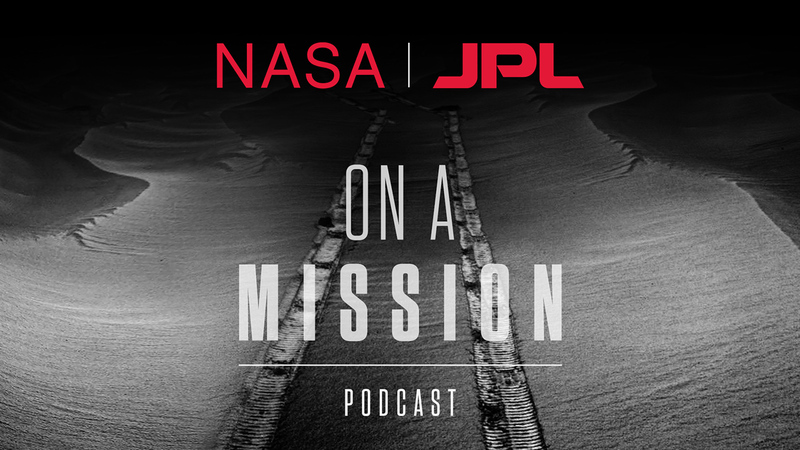 On a Mission' is a new eight-episode podcast series from NASA's Jet Propulsion Laboratory that follows the InSight mission as the robotic explorer journeys to Mars for a Nov. 26 landing. The first two episodes are available on Oct. 29 for download. This artist’s concept depicts the smooth, flat ground that dominates InSight's landing ellipse in the Elysium Planitia region of Mars. 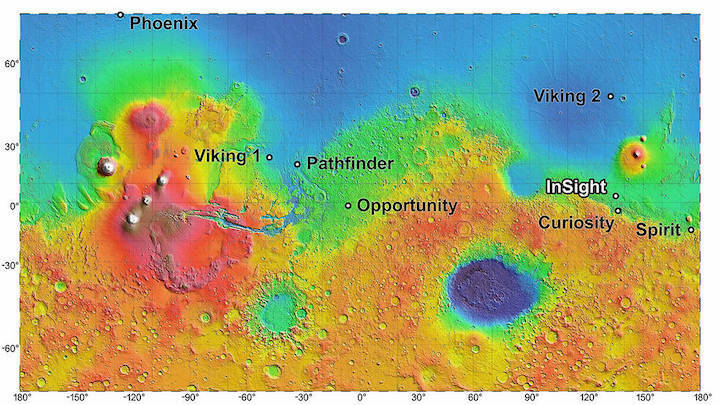 The landing site for InSight, in relation to landing sites for seven previous missions, is shown on a topographic map of Mars. NASA's Bruce Banerdt has spent 40 years scheming to get information about the Red Planet’s interior so the next 25 days should fly by. His answers will come, if all goes well, from the InSight spacecraft — it stands for Interior Exploration using Seismic Investigations, Geodesy and Heat Transport — set to land on Mars in a few weeks. The spacecraft launched May 5 aboard the United Launch Alliance Atlas V rocket from Vandenberg Air Force Base and will land at approximately noon PST on Nov. 26 on Mars after journeying millions of miles for the past six months. 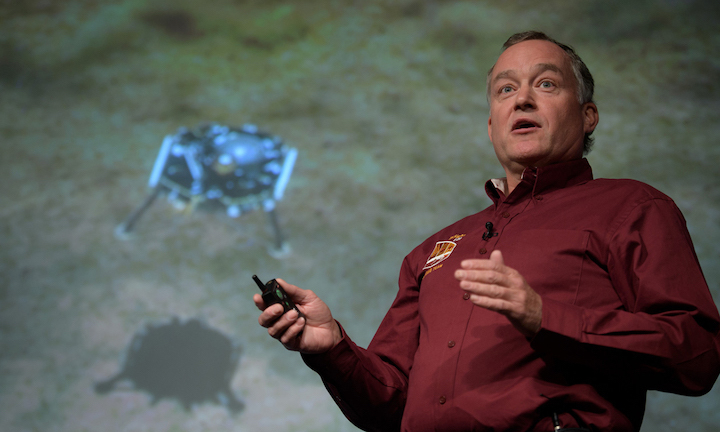 “I am stupendously excited to be up here today,” Banerdt, InSight principal investigator, NASA’s Jet Propulsion Laboratory, said last week during a briefing at NASA Headquarters. InSight’s status as Vandenberg’s first interplanetary mission in 60 years isn’t the only Central Coast connection. Key components, the solar arrays, were crafted by employees at then-Orbital ATK in Goleta. Due to a corporation acquisition, the firm now is part of Northrop Grumman Corp.
During the briefing on the Mars lander’s planned arrival later this month, Banerdt, Tom Hoffman and colleagues sported a big grins. 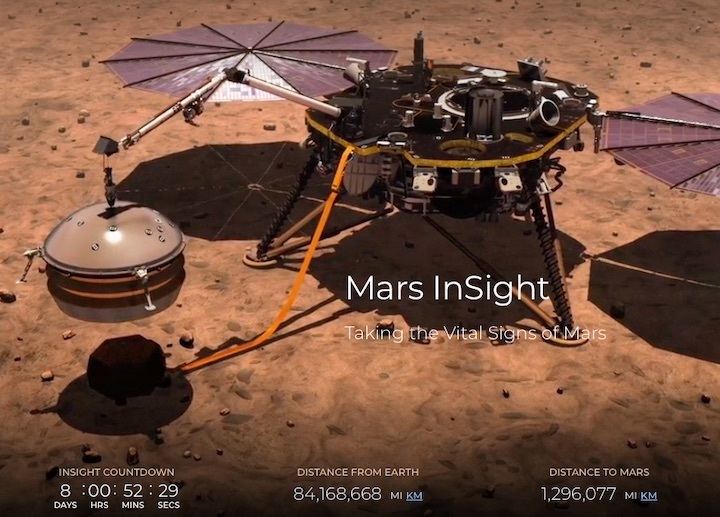 Since its departure on an especially foggy morning, InSight has been undergoing engineering and science checkouts while hurtling toward the Red Planet in anticipation of its Nov. 26 landing. 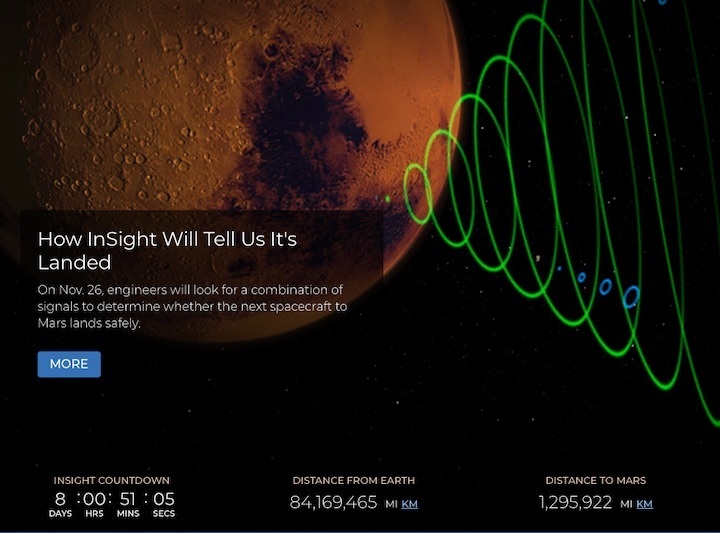 The spacecraft what team members have called a ballistic trajectory toward Mars with a countdown on website showing InSight more than 71 million miles from Earth and 3.7 million miles from Mars. “We’ve been getting closer every day,” Hoffman said. 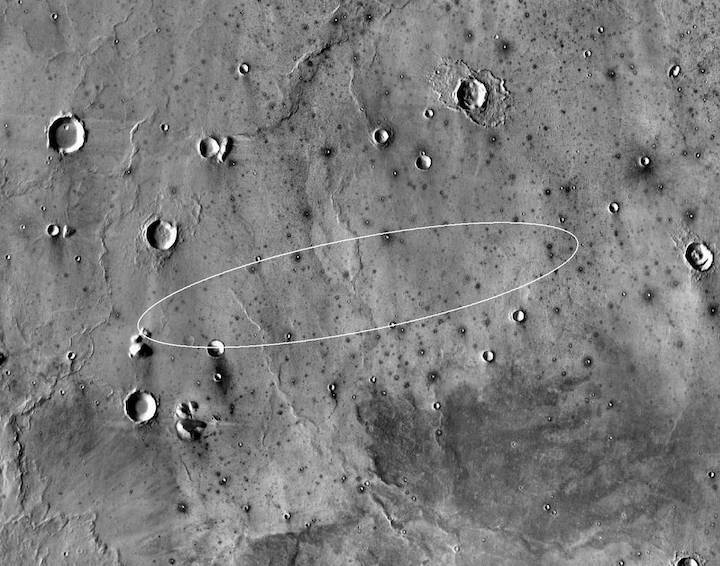 The team has made three trajectory correction maneuvers and plans three more before landing, to make sure InSight travels at the right speed and direction to arrive at the proper location at the top of the Martian atmosphere before its planned landing. On arrival day, InSight will enter the Martian atmosphere while traveling 12,300 miles per hour. In 6 1/2 minutes, InSight will slow to 5 mph just before landing through a complex series of maneuvers. 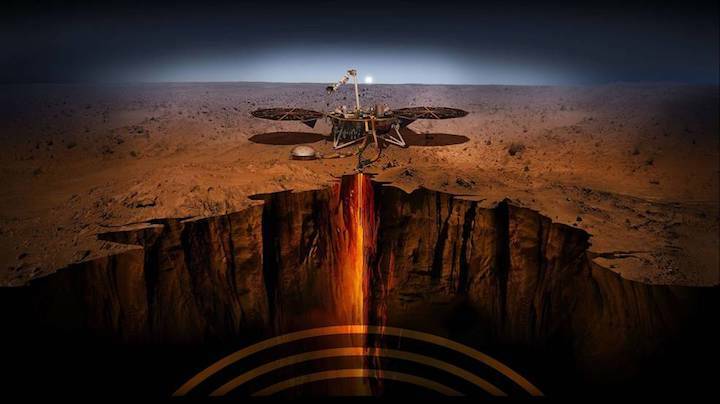 Approximately 10 weeks after getting safely on the Red Planet's surface and following other milestones, InSight will begin its science, using a seismometer to collect data. 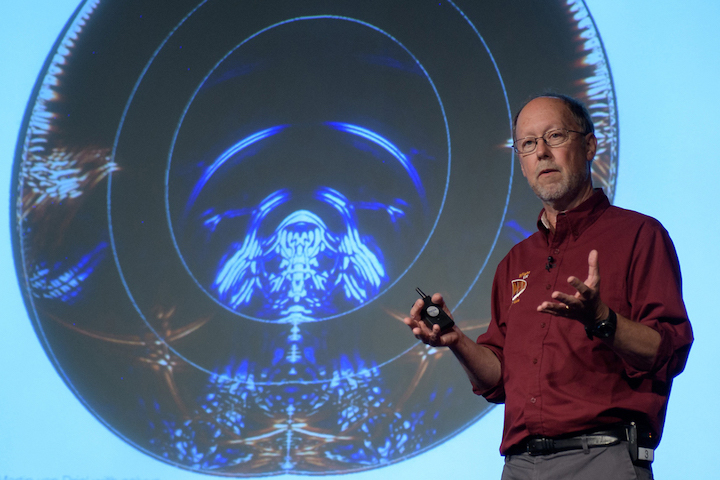 “InSight is going to explore the deep interior of Mars from the crust all the way down to the center of the planet, to its core,” Banerdt said. The Mars exploration will help scientists learn about other planets, including Earth, in the solar system, he added. Those eager for InSight's landing are banking on a pair of tiny satellites that tagged along to help ease the angst during InSIght’s final leg to Mars. Mars Cube One — actually MarCO-A and MarCO-B with each the size of a briefcase — will prove tiny satellites have a role in interstellar space, Hoffman said. “But we’re really really hoping that one of the other things they’re going to be able to do is give us communications while we’re doing our entry, descent and landing phase,’ he said. In the past, other spacecraft have provided real-time communication for Mars missions, but those aren’t available for InSight’s arrival, which gives MarCO-A and MarCO-B a chance to help. “They’ll fly in formation trailing behind us, waiting for us to start giving them a UHF signal and then they’ll be broadcasting that back to Earth so we know what’s exactly happening each step of the entry, descent, landing process,” Hoffman said. 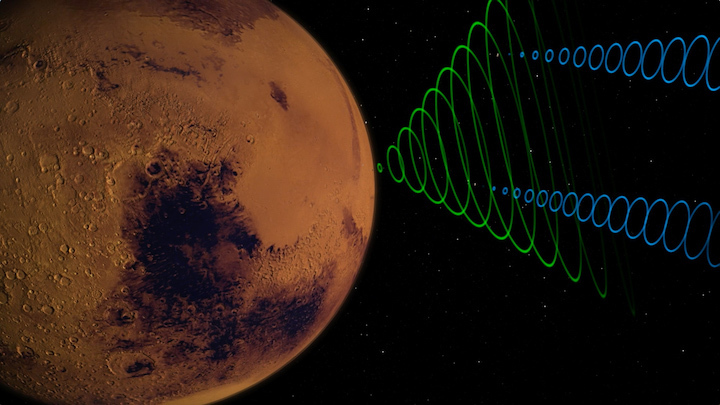 Mars Reconnaissance Observer also will gather data, but can’t relay it live to Earth. “We’re really hoping they work out as a technology demonstration,” Hoffman said of MarCO craft, adding the MRO will collect the data to send back to Earth three hours after InSight’s landings. 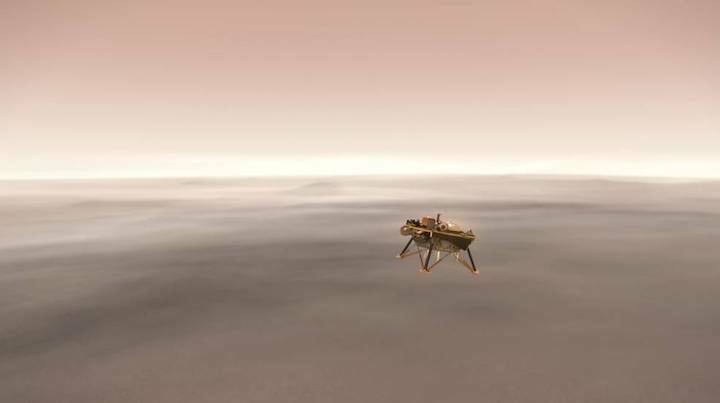 This illustration shows a simulated view of NASA's Interior Exploration using Seismic Investigations, Geodesy and Heat Transport (InSight) lander firing retrorockets to slow down as it descends toward the surface of Mars. InSight and MarCO flight controllers will monitor the spacecraft's entry, descent and landing from mission control at NASA’s Jet Propulsion Laboratory (JPL) in Pasadena, California, where all landing events will take place. InSight, short for Interior Exploration using Seismic Investigations, Geodesy and Heat Transport, is a Mars landerdesigned to give the Red Planet its first thorough checkup since it formed 4.5 billion years ago. It is the first outer space robotic explorer to study in-depth the "inner space" of Mars: its crust, mantle, and core.